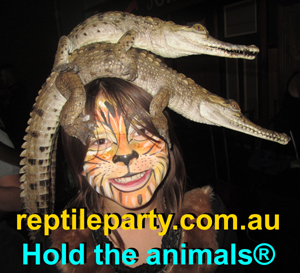 Reptile Parties® Melbourne, Snake Shows, Victoria. 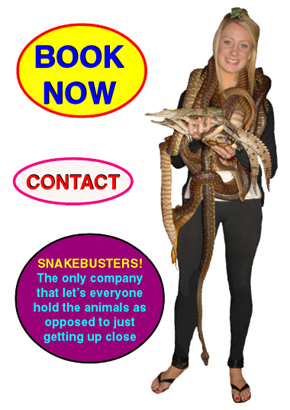 Snakebusters are the leading providers of mobile wildlife displays in Melbourne. 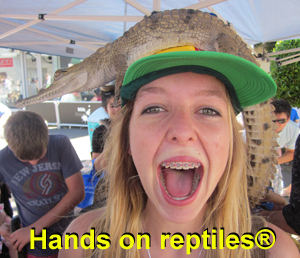 We are the only hands-on reptile shows that let people hold the animals. 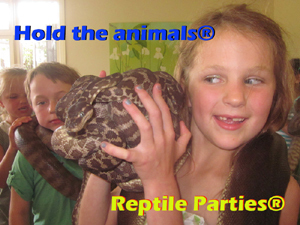 We invented the educational reptile party® which is why we own the trademarks! We attend more major corporate events, expos, festivals, kids birthdays and schools for incursions and shows across Victoria than anyone else. In summary, Snakebusters are Australia's best reptiles! 1/ We are the only company in Melbourne with a a hands on reptile show, where people can hold the animals. No other wildlife display lets you or your kids handle the animals. 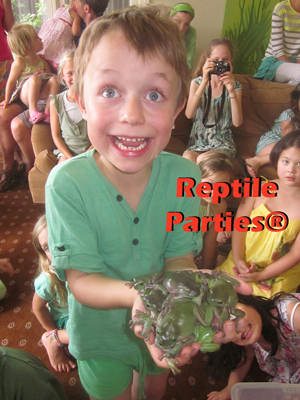 2/ We bring more reptiles to your venue than our imitators. 3/ Snakebusters are alone with the expertise to have vet certified surgically devenomized deadly snakes to guarantee safety for all. Less experienced displayers with venomous snakes are illegal and put you and your kids at risk! 4/ We are the only reptile displayers in Melbourne with more than 30 years in the wildlife education business, unrivalled expertise and a perfect safety record ... why take a risk with an inexperienced imitator? 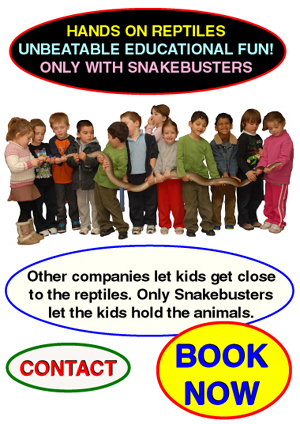 Educational wildlife shows by Snakebusters are of the highest standards. 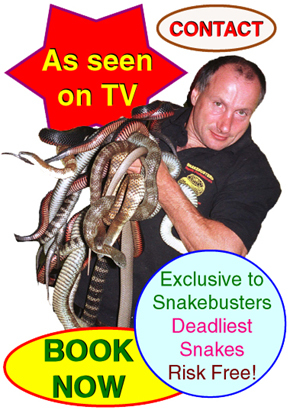 This is the official website of the multi-award winning Snakebusters as seen on TV. Snakebusters are owned by Australia's Snakeman Raymond Hoser. He is the world's leading expert on reptiles by any measurable criteria as well as a globally recognized wildlife authority. Ray Hoser has named more species and genera of snake than anyone else alive. In fact about one in 7 of the 3,400 scientifically recognized snakes on the planet carry a Hoser assigned species or genus name. He's also discovered and named dozens of species and genera of other animal types. Hoser's publications include 9 definitive books, hundreds of scientific papers, many the size of books, which in turn are cited as authoratitive everywhere. He has also contributed to countless scientific works published by others. The rest of the Snakebusters team who also do reptile party® shows, displays, incursions and courses in Melbourne are also recognized wildlife experts in their own right. The Snakebusters, reptile party team are the most highly trained in the business! When you book Snakebusters, you get wildlife experts and not just the animals! 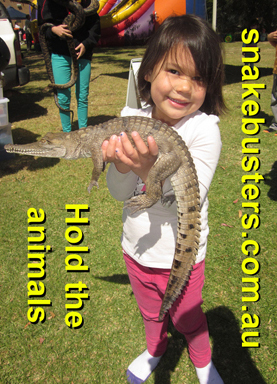 At kids parties, childrens expos, corporate incursion events and the like, only the Snakebusters team have the skills and sense of humor to make sure every child gets to enjoy Australia's only hands on reptile show or expo that lets people hold the animals. Most importantly this hands on experience is in a risk-free setting that no one else can match. ©1996-2016 - All rights reserved. Snakebusters® is one of many registered trademarks including for: Reptile shows® in Melbourne, wildlife education, snake catcher®, reptile removals and so on. All our other trading names such as Reptile Parties®, Reptile Party®, Raymond Hoser®, Snake Man®, Snakeman®, Snakebusters®, Snakebuster®, variants and trading phrases including Australia's best reptiles®, hands on®, hands on reptiles®, hold the animals®, handle the animals®, snake handler®, snake catcher® and variants are registered trademarks globally, including in all parts of Melbourne, Victoria and Australia, the USA and United Kingdom. Unauthorised use, including for online marketing of less-experienced reptile themed birthday party displays, kids parties, children's birthday events, kid's holiday program activities, reptile handler courses, snake handler education and training is strictly forbidden.